The University of North Carolina Wilmington, the state’s coastaluniversity, seeks students whoare academically curious, excited to be in the classroom, and willing to fully immerse themselves in our community of scholars. As our academic reputation continues to rise yearafter year, we embrace a community of well-rounded students who will add their talents and interests to ourcampus. 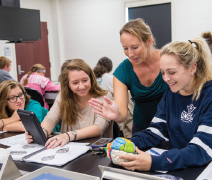 UNCW is dedicated to the integration of teaching and mentoring with research and service. The University values student engagement, creative inquiry, critical thinking, thoughtful expression, and responsible citizenship. The culture reflects a commitment to diversity and globalization, ethics and integrity, excellence and innovation. The rankings and recognition UNCW receives reflect the institution’s dedication to enriching the quality of life through scholarly community engagement and global outreach. 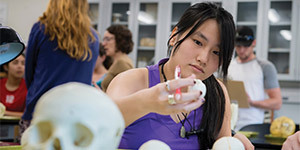 The College of Arts and Sciences is a cornerstone in the University’s pursuit of excellence in teaching, research, scholarship, artistic achievement, and service. It is committed to the life of the mind and the enrichment of the human spirit. Educating students for lives of personal, civic, and professional fulfillment; advancing knowledge and creativity in the arts and sciences; and striving for the betterment of the region, state, nation, and world are among the College’s fundamental values. Applied learning is a hallmark of the College’s experience; students participate in hands-on learning opportunities through faculty-directed research, internships, service learning, and capstone courses. The Cameron School of Business is fully accredited by the Association to Advance Collegiate Schools of Business, placing it in the top 30% of business education programs. It offers a wide range of business options for students and several international study abroad options with accredited partner universities in 11 nations. The Cameron Executive Network matches motivated undergraduates with retired and active senior executives. The College of Health and Human Services consists of three professional schools: the School of Health and Applied Human Sciences, the School of Nursing, and the School of Social Work. Faculty, staff, and students within the College are passionate about the overall enhancement of health and quality of life, especially within underserved communities and populations of the state, region, nation, and world. Accredited by the National Council for Accreditation of Teacher Education, the Watson College of Education develops competent professionals to serve in educational leadership roles, improving schools and society. The College offers 42 educator preparation programs at the undergraduate and graduate levels, as well as programs for teacher licensure. University College contributes to UNCW’s commitment to excellence in undergraduate education by building relationships and creating experiences to support student transitions, persistence, and success through academic advising, courses, programs, and resources. The Honors College provides students with a strong learning community focused on achievement. More than 700 gifted and goal-oriented scholars in the Honors College receive multiple benefits and resources to take their education further, faster. 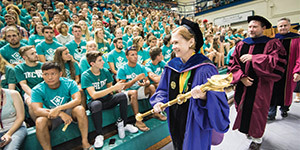 UNCW’s faculty culture emphasizes teaching and mentoring, incorporating research as an important component of the student learning experience. A full 86% of faculty members have earned a PhD or the highest degree in their field. Academic programs across campus encourage students to engage in practical hands-on experiences through the ETEAL applied learning initiative. The Office of Student Leadership and Engagement creates dynamic opportunities for students to become actively involved with the community, or they can participate in leadership andservice activities on campus in one of 270+ registered student organizations. UNCW offers a variety of wellnessopportunities, including a recreationcenter with cardiovascular conditioning machines, free weights, and weightmachines. It includes sports courts,an indoor track, pools, group exercisestudios, and a climbing wall. UNCW also offers intramurals, sport clubs, recreation fields, and adventure programs such as camping, surfing, and kayaking. UNCW requires all fall freshmen to reside on campus for their first academic year. Research shows students make a smoother transition to collegiate life, achieve higher grade point averages, develop stronger friendships and a love of place, and graduate at higher rates. On-campus housing for transfer students is limited and not guaranteed. UNCW’s 19 intercollegiate teams compete in NCAA Division I sports with Seahawk pride and integrity. UNCW’s student-athletes excel not only on the fields and courts but in the classroom as well, consistently posting strong graduation success rates, with four teams achieving perfect 100 scores, according to NCAA’s most recent report. Wilmington is a charming and friendly city on the southeastern coast of North Carolina. Located just minutes from numerous beaches, it has a renowned historic district as well as a vibrant arts culture and literature, film, and music scene. Wilmington International Airport (ILM) provides commercial air service to cities both domestic and abroad and is just six miles from campus.